Harrison Elementary School Principal Matt Deeds cuts the ribbon Tuesday, May 22. Pictured, from left, are Rob Parker, CEO of the Kosciusko County Chamber of Commerce; Mary Cossey, NIPSCO; Warsaw Community School Corporation Chief Analytics Officer Shelly Wifong; Warsaw Community School Corporation Chief Academic Officer David Robertson; Warsaw Community School Corporation Communications and Accountability Officer Dani Barkey; Tim Pitts, Import Construction Services; Board of School Trustees President Heather Reichenbach; Warsaw Community School Corporation Director of Maintenance, Buildings and Grounds Jim LeMasters; Doug Baumgardner, 1st Source Bank; Warsaw Community School Corporation Superintendent Dr. David Hoffert; Deeds; Russ Cramer, 1st Source Bank; Sam Cook, Warsaw Community School Corporation maintenance; Steve Dieringer, 1st Source Bank; Warsaw Community School Corporation Chief Financial Officer Brandon Penrod; Andy McCleary, Kosciusko County Chamber of Commerce; Lou Ann One, NIPSCO; Leonard Hobbs and Reed Krynski, both of PSG. WARSAW — The Warsaw Community School Corporation made it official — the school best known for the black and orange colors of its mascot tiger is going green. 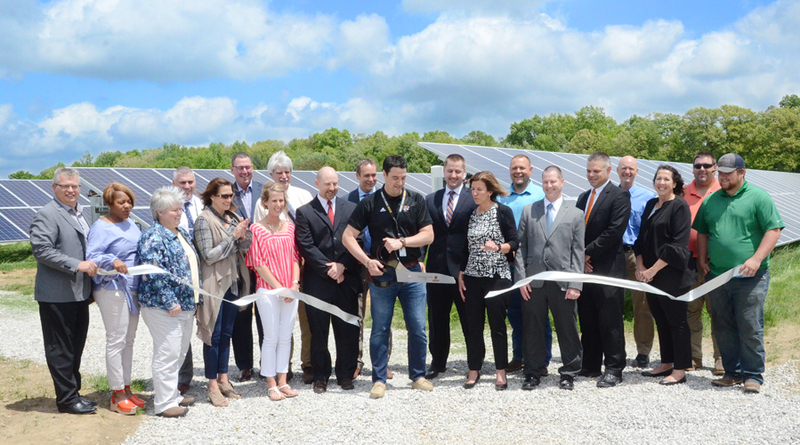 Thanks to a $9.3 million loan secured earlier this year, representatives of the school corporation, along with key partners in the project, held a ribbon-cutting ceremony Tuesday, May 22, to celebrate the installation of solar panels at six corporation locations. Five schools — Eisenhower, Leesburg and Harrison elementary schools, along with Lakeview and Edgewood middle schools and the corporation’s central office either already have the panels or will soon have them installed. The ribbon cutting ceremony was held at Harrison Elementary School. “I appreciate your partnership,” said Superintendent Dr. David Hoffert to business leaders and other partners in the project. The superintendent said the installation of the panels was a moral imperative for the school corporation. According to Hoffert and Corporation Chief Financial Officer Dr. Brandon Penrod, the partnership with the utility company will allow the corporation to go to the grid for energy at times when lack of sunlight reduces the efficiency of the panels. Conversely, NIPSCO will collect extra energy when the panels produce more than the facilities requires. “This project allows us to be efficient with community dollars for funding of our schools and also power, environmentally safe and efficient modules,” said Heather Reichenbach, president of the corporation’s board of school trustees. Reichenbach added that Warsaw schools with STEM education curriculum can also benefit by studying the positive effects the panels create.